An oil soaked bird struggles against the oil slicked side of the HOS Iron Horse supply vessel at the site of the Deepwater Horizon oil spill in the Gulf of Mexico off the coast of Louisiana Sunday, May 9, 2010. The Gulf of Mexico has long been written off as America’s gas station, jeopardizing Gulf Coast communities, coastal economies, and thousands of whales, sea turtles, dolphins, oysters, and other species that wind up in the path of oil and gas spills. Earthjustice, on behalf of three conservation groups, sued the Trump administration today for failing to complete a legally required consultation about offshore drilling’s harms to threatened and endangered species in the Gulf of Mexico. The National Marine Fisheries Service and the U.S. Fish and Wildlife Service are required under the Endangered Species Act to complete a consultation with the Bureau of Ocean Energy Management (BOEM) on its oversight of oil and gas operations that could impact threatened and endangered species. The last time the agencies completed a consultation, called a biological opinion, was in 2007, three years before the BP Deepwater Horizon disaster which led to the worst offshore oil spill in U.S. history. With today’s lawsuit, filed in federal district court in Florida, the Gulf Restoration Network, Sierra Club, and Center for Biological Diversity are challenging the agencies for unreasonably delaying completion of a new consultation and seeking a court order to compel them to complete it within three months. An in situ burn of oil from the Deepwater Horizon disaster sends towers of fire hundreds of feet into the air over the Gulf of Mexico on June 9, 2010. A new biological opinion likely would result in additional safeguards to prevent further harm to sea turtles, whales, and other threatened and endangered species from oil and gas operations in the Gulf. In 2010, the BP oil spill caused the death or serious harm to billions, if not trillions, of fish, sea turtles, whales, and other animals, including more than 100,000 individuals of species listed as threatened or endangered, according to scientists’ estimates. Recognizing that the disaster devastated the Gulf ecosystem and its wildlife — and invalidated many of the assumptions in the 2007 biological opinion — the Services and BOEM reinitiated the consultation process in late 2010. However, more than seven years later, the agencies still have not completed a new biological opinion, even as the Trump administration plans to ramp up offshore drilling operations in the Gulf. “The Gulf of Mexico has long been written off as America’s gas station, jeopardizing Gulf Coast communities, coastal economies, and thousands of whales, sea turtles, dolphins, oysters, and other species that wind up in the path of oil and gas spills. We seek to hold the Trump administration accountable to the law in its duty to protect endangered species and compel the oil and gas industry to clean up its act in the Gulf,” said Chris Eaton, Earthjustice attorney. 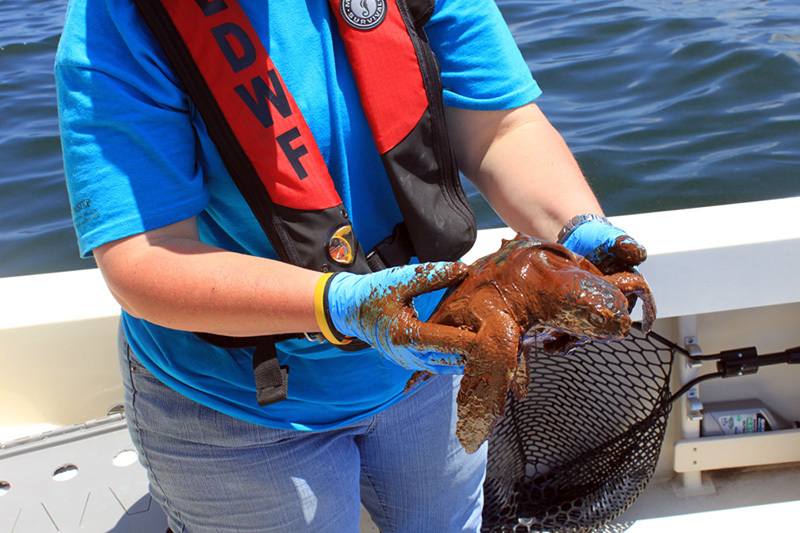 A small Kemp's Ridley turtle, recovered during clean-up efforts following the BP oil spill, is covered in oil. “For over 10 years, the federal agencies that are responsible for the protection of threatened and endangered species in the Gulf of Mexico have been sitting on their hands. 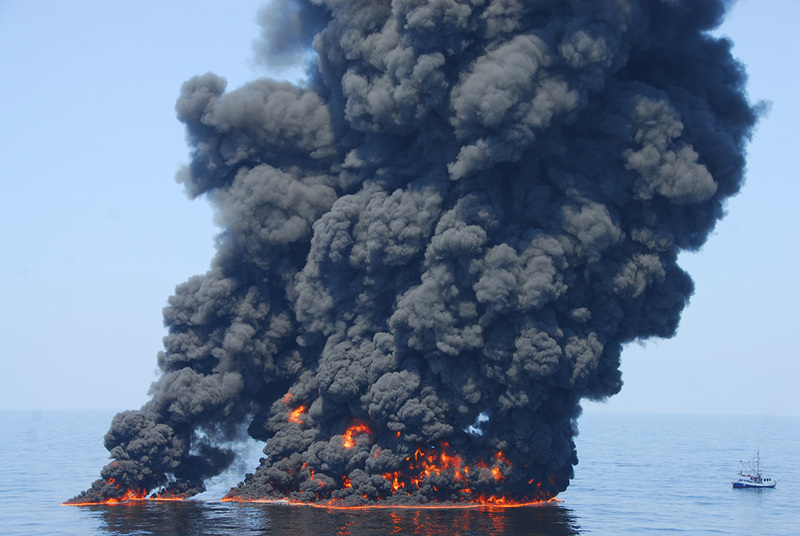 As we saw in the BP disaster, the harm caused by the oil and gas industry wreaks havoc on our Gulf. It’s time for these agencies to do their job and comply with the law,” said Cynthia Sarthou, executive director of Gulf Restoration Network. Read the legal document filed today. Read this news release in Spanish. “Oil and Gas in the Gulf of Mexico,” report by the Gulf Restoration Network. “Programmatic Damage Assessment and Restoration Plan, Chapter 4 - Injury to Natural Resources,” National Oceanic and Atmospheric Administration, on the BP Deepwater Horizon oil spill.